If you’re a freelance writer, it can be hard to make a name for yourself. That’s because many clients insist the writers act as ghostwriters, and thereby never claim rights to the work. However, guest posts could serve as a platform even if you often write for other people. After all, even ghostwriting sharpens your skills, and guest posts allow you to use your talents by crafting articles under your own name. As a result, you have the chance to establish credibility in specific industries — and grow your portfolio as you do it. 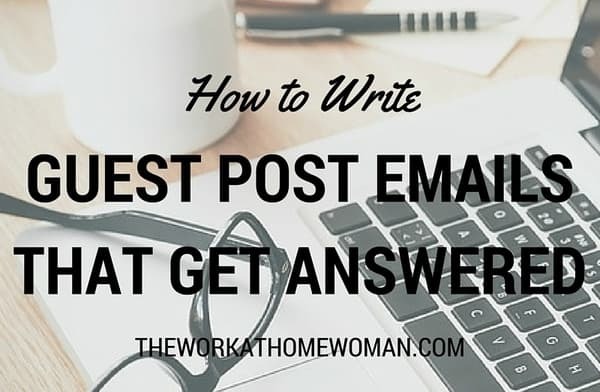 However, writing guest posts may not deliver instant or simple success. Challenges could arise if you discover a blog isn’t currently accepting guest submissions, or perhaps already has a roster of reliable guest writers, making it very hard for new content creators to get chances to prove themselves. If a guest post pitch email isn’t well written, it becomes increasingly likely that you won’t get published. Keep reading to discover how to write a pitch that showcases your worthiness as a writer, gets read, and generates a prompt response. Check and Follow Submission Guidelines. Statistics say 168 billion emails are disregarded per day, and 55% of people admit to not opening and reading their emails. This data isn’t meant to discourage you from writing pitch emails, but it should emphasize why it’s so important to follow instructions. If you’re interested in writing for a website, make sure it is currently accepting submissions. Even if the content manager isn't looking for new contributors, there may be a contact request form you can fill out to receive an alert when pitches are being accepted again. Furthermore, ensure submission guidelines are carefully followed. For example, emails may be required to have specific subject lines, or risk being passed over. Also, while some websites may require extremely detailed pitches, others may just want outlines. Failing to be diligent in providing what the recipient wants could mean your pitch email never gets read all the way through. 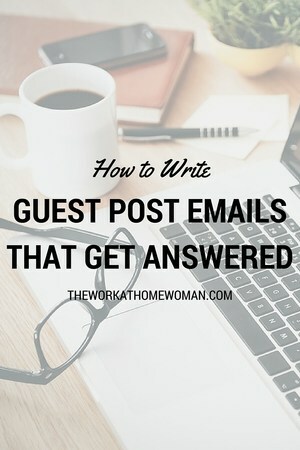 Plus, if you don’t follow instructions, that shortcoming could make the recipient wonder if you’d also do the same when submitting guest posts. Whether you’ve been writing for two years or two decades, you’re probably already aware of the fact that clarity is essential when making your point and engaging readers. The same is true when composing a pitch email. There’s a good chance recipients won’t have patience if you write a paragraph and a half before explaining what subject or idea is being pitched, and why. In addition to being succinct, every word should be purposeful. As the saying goes, “when in doubt, take it out.” A detail oriented friend may be a good ally to have while editing, especially if you’re getting fatigued from repeatedly reading and writing text. 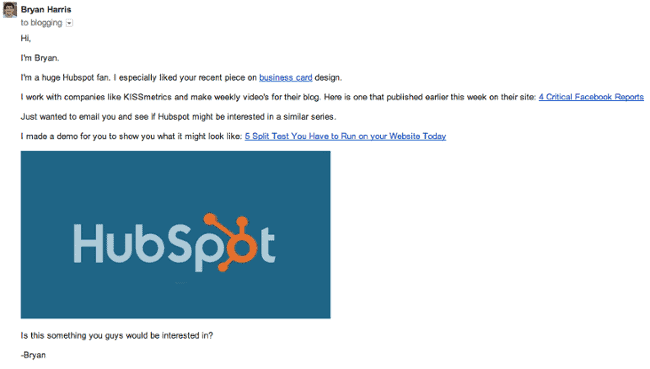 The screenshot below is a successful blog pitch example. Impressively, the writer got his point across in in less than 10 lines. It’s also worthwhile to consider going above and beyond to make a strong impression. Experiment with ways you could push the boundaries without using extraneous words or losing focus. Depending on the type and style of the blog, you might want to create a video-based pitch to help your enthusiasm come across clearly. No matter what kind of approach you take, convey the fact that you’ve done your research and are aware of the website’s reader base, tone and how your writing would not only fit well with what’s there, but also make it better. Blogging data indicates over 60% of people think a blog is more credible if multiple authors contribute to it. Clearly, that statistic is good news if you’re thinking about getting involved in guest blogging, particularly by writing for a blog that currently only has a few distinctive voices. However, pitches are unlikely to be well received unless they are catchy and well-developed. If a pitch is too vague, it’s nowhere near ready for review by a blog’s representatives. We’ve already talked about the need to get to your point quickly, but brevity doesn’t mean explaining things in ways that are incomplete or hasty. It’s not enough to write a pitch that says, “I’d like to write an article that explores the pub culture in Ireland.” You need to elaborate about which of the many factors of that cultural aspect you want to explore. Irish pubs are simultaneously social hubs to catch up with friends, places to watch televised sports matches with fellow fans, and homey buildings where patrons enjoy freshly poured pints and some peanuts or bags of chips. However, some pubs also host well-attended quiz events, plus live music or DJs. Because the pub culture is so warmly embraced by residents and visitors, some pubs even host educational events that relate to newsworthy happenings. Give Proof of Your Skills. Writing a good pitch email requires more than just an interesting idea. It’s also necessary to show you have the skills necessary to write a great post. Give links to online portfolios when possible, and always aim to show examples of work that are similar to the style of the blog you’re pitching. If you have primarily worked as a ghostwriter, you may not have many samples to provide. However, you could explain the reason for your lack of samples and invite the recipient to test you by requesting you write a blurb on a specified topic. Those kinds of skill verification methods are common, and the results may be more persuasive than your resume. Just like the rest of the email, the conclusion should be as concise as possible. It’s usually sufficient to thank the recipient for the consideration, and then offer the best method to reach you. Although people commonly invite recipients to feel free to ask further questions, it’s unnecessary to say that. If someone’s really interested in bringing you on as a guest blogger, such communications are inevitable. Although email pitching is not easy, successful results can give your writing career momentum. By following the guidelines above, you could theoretically save time by not attempting to interact with people who are not likely to respond.